Do you require an enthusiastic and engaging Presenter or MC to ensure your event runs smoothly and successfully? For any event to succeed it requires more than a good speaker, comfortable venue and tasty catering. The way that delegates are treated and looked after is also vital. If the hosting is exceptional, then delegates leave feeling well looked after and exclusive; the word will spread about their experience at your event, resulting in positive feedback for your organisation. Duncan uses his comprehensive experience as a facilitator to ensure that your event runs smoothly and your audience remain engaged, entertained and enjoy their time with you. 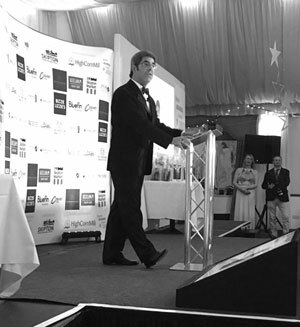 I just wanted to say a personal thank you for everything you did to contribute to the success of Skipton Business Awards. I was so impressed by your calm professionalism and felt confident that you were in total control.